The Alvar Aalto Museum’s spring exhibition in April 2014 displayed the results of a unique collaborative project: an architectural opera Let’s Build the School! produced by the pupils of Onerva Mäki School for hearing and visually impaired children in Jyväskylä. Annukka Pakarinen from Alvar Aalto Museum interviewed the opera’s Spanish director, theatre director Jorge Raedó, about his experiences in working with children and about his interdisciplinary art education project Let’s Build the City [Rakennetaan kaupunki]. How did the Let’s Build the City! project get started? The Let’s Build the City! opera is the work of the German Paul Hindemith from 1930. 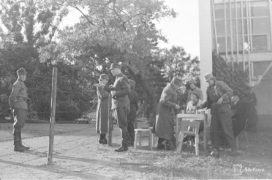 Together with the producers of the project, Maria Nordin and Anna Rombach, we planned the first opera production based on Hindemith’s opera, and it was realised in cooperation with the Museum of Finnish Architecture in March 2012. The idea was to combine opera and architecture on children’s terms. What is the aim of the Let’s Build the City! opera? The aim of the opera is to share experiences about making theatre with school pupils. When we make art together with the pupils and teachers they get to see how representatives of different art disciplines operate, as well as everything that happens before the opening night of an opera. The theatre is an excellent place for perceiving space. Movement, distance and time emerge through theatre. The aim of the architectural opera is also to increase understanding of how building and the birth of cities are a result of the interaction and cooperation between us humans. Where did the idea come from to bring an architectural opera to Jyväskylä’s Onerva Mäki school? I wanted to understand what space means to a blind person. A few years ago I was in contact with Outi Lappalainen who was is an instructor at the Onerva Mäki school. Before commencing with the workshop linked with the architectural opera, I wanted to get to know the pupils and their working methods in an informal way. How long was the process of getting Let’s Build a School! ready for public performance? Each opera has been a bit different. We worked with the Let’s Build a School! opera for eight months. In the autumn term of 2013 the students worked on the libretto. 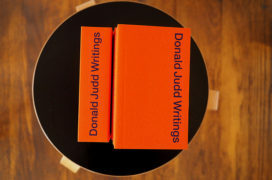 They constructed the text on the basis of questions and directives I had provided them. 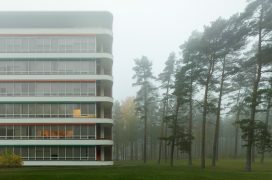 One of the characters in the opera is Alvar Aalto and during the autumn some of the pupils visited some buildings designed by him in order to get inspiration for their texts. The poet Jenni Kinnunen went through all the texts the pupils had written in a haiku style, and in January the libretto was ready. Sanna Ahvenjärvi and Tapio Lappalainen were responsible for composing the music which the string quartet Academus and the baritone Paavo Nisula are performing together with the pupils. We were able to start rehearsing in early 2014. We often worked one morning a week, but towards the end the pace accelerated somewhat. How was it to work with the pupils of the Onerva Mäki school? It was an experience I’ll remember forever. The school pupils excelled themselves every day. They threw themselves into the project whole-heartedly. In previous operas, I worked with one or two groups of pupils and a teacher, and knew from the very beginning who would be on stage. In the Let’s Build a School! project I worked, on the other hand, with several different kinds of groups and I only knew a month before the first night which of the pupils would be performing. Working with hearing and visually impaired pupils taught me a lot; for example, the different sense of rhythm of the hearing impaired pupils brought its own challenge to the work. 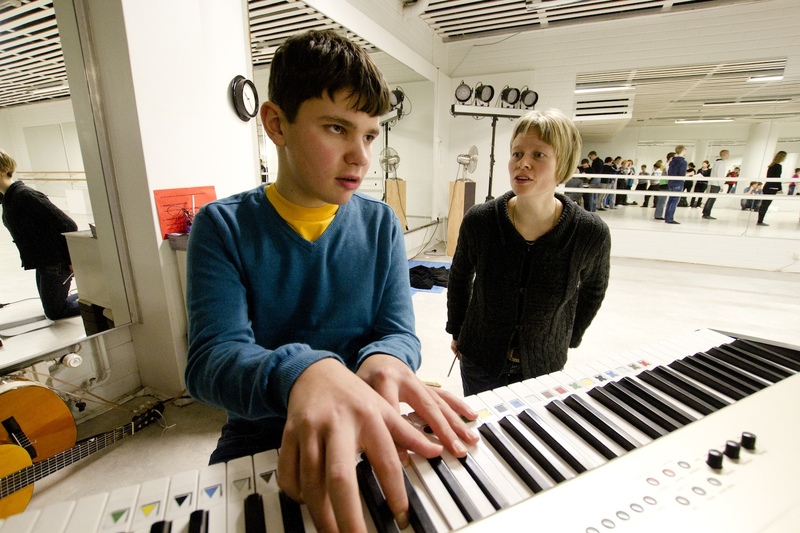 The school experienced a time of great change when the Jyväskylä school for the visually impaired and the Haukkaranta school were combined at the beginning of 2013 to form the Onerva Mäki school. The architectural opera was adapted to correspond to the needs of the school, and the Let’s Build the City! production received a new form as the Let’s Build a School! opera. The theme running through the performance is the pupils’ thoughts on the design of a new common school building. What kind of work group is needed to realise such a production? A lot of talented people are needed to make a successful opera. It’s like a good soup that is prepared from several different ingredients. 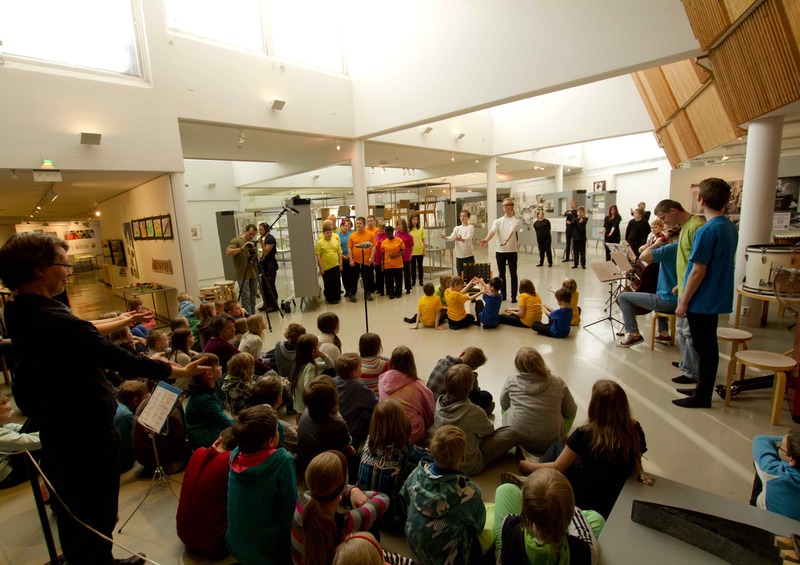 Participating in this project, in addition to the pupils, are the teachers and assistants of the Onerva Mäki school, the composers, string quartet, baritone, Jyväskylä dance school, artists, and of course staff from the Alvar Aalto Museum who have organised the exhibition and workshops. In addition, many different parties have supported the Let’s Build a School! project. I’m very grateful for all the support. What is in store for you in the future? I’m already making preparations for the new architectural opera that will have its first night in April 2015. The opera by Riikka Talvitie and Marjo Heiskanen will be realised together with Kaisaniemi school in Helsinki. We’re also having discussions with the Unimusica school in Bogotá about taking the architectural opera to Colombia. In addition, there are also plans for cooperation with the Open Educational Resource (OER) webpage that provides open learning material. Translation into English: Gareth Griffiths.